Questioning Engagement. A participant at a mining conference I presented at in South Africa asked what happens when the Pyramid of Engagement is broken. It was an excellent question that created a small epiphany for me about an inverted pyramid. Here is an upside down picture of the pyramid of engagement. It represents employee engagement falling away or draining out of an organization. 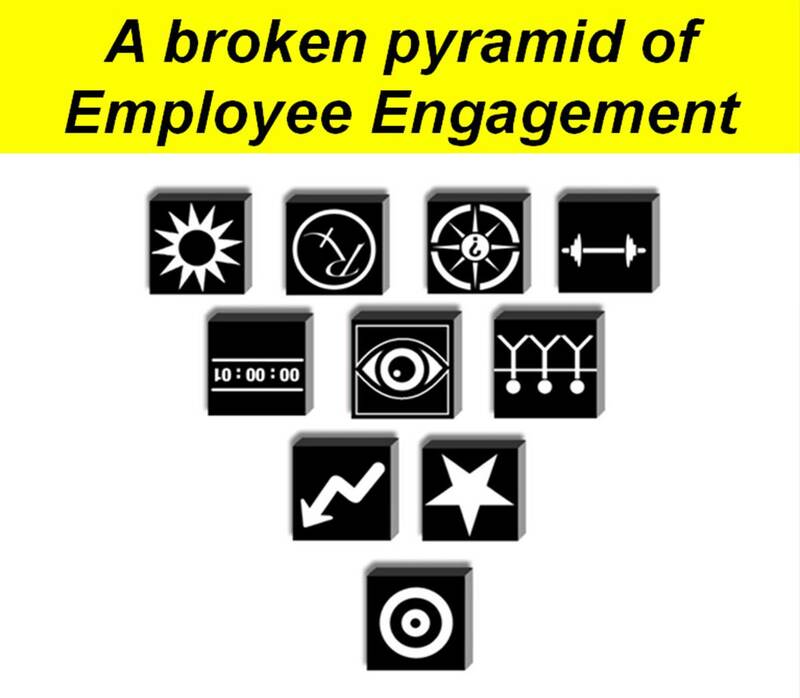 Following the inverted pyramid image is a list of 21 signs that employee engagement is broken for an organization or an invididual. Mental, emotional, and organizational energy is frittered away and work is experienced as an energy drain not an energy gain. Flip. Let’s turn the pyramid of employee engagement around to it original position so that we can: achieve results, maximize performance, path progress, build relationships, foster recognition, master moments, leverage strengths, make meaning, enhance well being, and enliven energy. David Zinger is devoted to helping organizations and individuals fully engage in work to build and sustain successful and meaningful results and relationships. Request his speeches, workshop, or consulting today on the pyramid of employee engagement to engage all of your employees. Mr. Zinger founded and hosts the 4700+ member Employee Engagement Network. Contact David today at zingerdj@gmail.com. Energy. The raw material of engagement is energy. It takes energy to engage and authentic engagement contributes to our energy. Energy comes in a variety of forms: mental, emotional, physical, organizational, and spiritual. We must strive towards mastery of physical, mental, and emotional energy. Power up your engagement through energy. In the past 10 years business and the workplace has had a strong focus on mental, physical, emotional, and spiritual energy. Although this is a relatively new focus for the workplace these 4 energies have been a strong part of the traditional medicine wheel used by First Nations People for hundreds of years. Jim Loehr and Tony Schwartz wrote about the 4 energies in The Power of Full Engagement in 2003. This was one of my favorite earlier books on the topic of engagement. I appreciated their declarative statements ranging from energy, not time, is the fundamental currency of high performance to performance health and happiness are grounded in the skillful management of energy. They argued that to be fully engaged we must be physically energized, emotionally connected, mentally focused and spiritually aligned with a purpose beyond our immediate self-interest. They stated that physical capacity is the quantity of energy, emotional capacity is the quality of energy, mental capacity is the focus of energy, and spiritual capacity is the force of energy. We need lots of high quality energy to provide us with focus and force to achieve results. Loaded with suggestions, research and practical practices this book can help you transform and leverage your energy for full engagement. Energize through high-quality connections. Jane Dutton from the Ross School of Business and a leader in positive organizational scholarship has done a lot of research and writing on energy in organizations. Energy is the sense of “being eager to act and cpable of action.” Dutton offers an evidenced based pathway to foster and enhance organizational energy through the strength of high-quality connections at work. Energy is a limited but renewable resource and managers can contribute immensely to energy creation. High-quality connections not only energize others and ourselves, they have a significant impact on well-being and lessen or eliminate corrosive connections. Everyday interactions build upon respectful engagement, task enabling, and trusting can bring dynamic vitality to engagement and organizational results. Mobilize energy and avoid traps. Heike Bruch and Bernd Vogel outlined how leaders can boost their organization’s energy and ignite strong performance. Organizational energy is the force behind an organization or team works. The organizations must mobilize its emotional, cognitive, and behavioral potential. There are four states of energy based on intensity and quality: corrosive energy, resigned energy, comfortable energy, and productive energy. In productive energy, we see high levels of passion, mental agility, and effort aligned with organizational goals. Energy states are predictive of numerous gains in performance, productivity, efficiency, customer satisfaction, and customer loyalty. To maximize organizational energy, organizations must guard against three energy draining traps: over complacency, eroding corrosion, and never ending acceleration. Walk ten. Robert E. Thayer wrote an insightful and well-researched book on energy and mood: Calm Energy: How People Regulate Mood with Food and Exercise. He conducted in-depth research on how we control mood and how often we control mood through food. Thayer demonstrated in a number of studies that a more powerful way to control mood and energy was by short periods of brisk walking — after just 10 minutes of brisk walking energy was significant increased for one hour. We much replenish our energy during the day and short periods of brisk walking or short periods of napping offer quick pathways to rejuvenating work. Ask the number one energy question of yourself and others. Ask the primary energy question. Donald H. Graves spent a year studying the relationship between energy and teaching. He worte a great book on the energy to teach. In essence, he travelled around America asking teachers one basic question. I think this is the best question you can ask yourself and others to provide an open ended pathway to an energizing conversation. What gives you energy, what takes it away, and what for you is a waste of time? Of course, we must bring our responses to life by making changes and taking action. Conclusion to our 10 part series. This is the final post in this series on the pyramid of engagement. I trust you found it informative and valuable. A pyramid in not built in one day. During 2012 I will refine each block and offer the pyramid of engagement in keynotes, 1/2 day workshops, full day workshops, and intensive two day workshops. Isn’t it time you worked with a solid structure and evidenced-based practices to increase employee engagement? 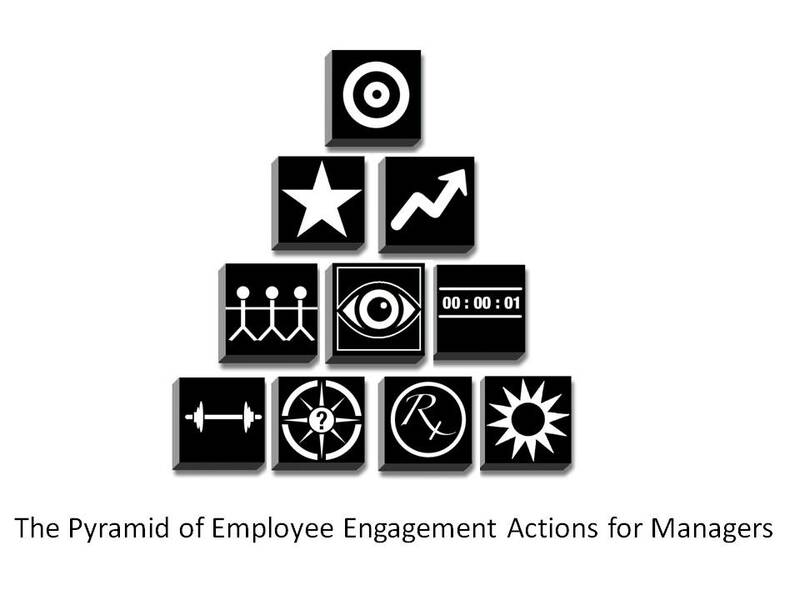 David Zinger built the 10 block pyramid of employee engagement to help managers bring the full power of employee engagement to their workplaces. If you would like to arrange to have this course or workshop for your organization or conference contact David today at 204 254 2130 or zingerdj@gmail.com. Enhance Well-being. We need to create wellbeing inside of work. There are things we can do outside of work but how we promote and enhance well-being within work is becoming increasingly important as mobile devices makes work portable and 24/7. We must eliminate toxic workplaces poisoned with a lack of respect or mutuality. We must create a profound wellbeing where people leave work enlivened and enriched rather than depleted and deadened. Enliven the five elements of well being. Enliven the five elements of well being. Rath and Harder in Well Being state that well being is a combination of “our love for what we do each day, the quality of our relationships, the security of our finances, the vibrancy of our physical health, and the pride we take in what we have contributed to our communities. Most importanty, it’s about how these five elements interact” (p. 4). About 66% of us are doing well with at least one of these elements but only 7% of us are thriving in all five areas. This leaves much room to improve well being at work by working on our career well being, social well being, financial well being, physical well being, and community well being. By the way, I don’t think we try for the infamous work/life balance with these elements, rather we try and have healthy flow that benefits us and others. Establish PERMAnent Well Being. Martin Seligman approaches well-being with the caution of a scientist and the optimism of someone who developed the approach of learned optimism. In Flourish, Seligman went beyond happiness work to examine flourishing and offering practical suggestions on instilling well being. His perspective of well being also has a foundation of 5 elements, different than Gallup, and structured around the mnemonic PERMA. PERMA stands for: positive emotions, engagement, relationship, meaning, and achievement. Positive emotions and the pleasant life contribute to our well being and happiness. Engagement creates well being with powerful connections to work, belonging and serving. Relationships, one of the 10 blocks of the pyramid of engagement, in study after study is found to be one of the most salient contributors to well being. Meaning, the most recent block we examined in this series on the pyramid of engagement is vital for health. Achievement has been a more recent insertion in Seligman’s approach to authentic happiness and well being. Seligman examined his own love of playing bridge and realized how much achievement plays a role in well being. Achievement fits well with the top three blocks of the employee engagement pyramid: results, performance, and progress. Mindful leadership. A recent Harvard Business review blog post by Holly Labarre quoted Pamela Weiss: “If you want to transform an organization it’s not about changing systems and processes so much as it’s about changing the hearts and minds of people. Mindfulness is one of the all-time most brilliant approaches for helping to alleviate human suffering and for bringing out our extraordinary potential as human beings.” Mindfulness seems so subtle, almost anemic for well being, but for a world that has gone crazy busy it can keep us well, centered, aware, connected, and present. We often seem to be searching for dramatic data-driven tools when this subtle and powerful tool is always available to us, embedded in us, and always only a moment away. 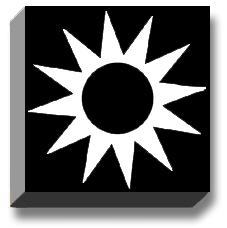 If the video does not open in this window, click here. Establish and maintain psychological and social safety. We have focused and improved our work on physical safety at work. We need to keep all employees safe. In addition we need to ensure that our work and workplaces are infused with psychological and social safety. Safety is created through mutual purpose and mutual respect. It means we care about each other and we care about what each other is interested in. This must be genuine and is more than a fuzzy warm feeling. People read a lack of safety in seconds and this thwarts are ability to achieve results, build relationships and be well at work. A lack of safety saps away well being at work and creates ineffective conflicts and confrontations. We seem to have a bigger safety issue than engagement issue at work. It feels unsafe for most workers to be honest, direct, and respectful about engagement. An unintended consequence of the infamous anonymous survey in engagement is that we are telling employees we don’t want to know who they are, thereby making employees invisible. Robust engagement needs a name and a face. Management also justifies anonymous surveys because they don’t believe workers will be honest unless they are anonymous. We need to stop thinking of disengagement as a punishable offence and instead use it as a trigger for meaningful listening and talking about work. Be a well being heretic. I believe we have too much fluff and far too many mistaken notions about specific wellness approaches at work. I have believed this for 30 years but just recently has it coalesced together into the Heretic’s Manifesto of Well Being. I do not write about this frivolously having been an employee assistance counselor for almost 20 years and a university educator in educational and counseling psychology for 25 years. We must find wellbeing inside of work and not wait until we are outside of work at the end of our day or in retirement. Hope is a misguided future perspective taking us away from where we can really make a difference, right here – right now. There is no stress in the present moment so strive to be where you are. Self-esteem is an evaluative trap that snares you like cheese snares a mouse with the snap of the trap. Accept yourself don’t evaluate yourself. Life comes before work and work/life balance and any balance is dynamic like a teeter totter. Well being is only a concept until we engage in well doing. Ignorance is more important than knowledge in fostering and enhancing well being. We being by not knowing. People don’t actually hear most interpersonal feedback unless they feel safe and safety is the only way to overcome most of our problems. Genuine caring trumps professional competence in almost every relationship. Achieving happiness is a shallow and insignificant approach to living. Structure trumps willpower in promoting and fostering well being. Powerful questions we ask ourself are the ideal WD40 for a brain clogged by an amygdala seizure. Wellbeing is strong stuff. We must know, live and leverage our strengths in the service of others. Relaxation is the anemic aspirin of stress management and can actually cause stress. What lessens your stress today could be a major contributor of stress tomorrow. There are no algorithmic certainties of well being only heuristic probabilities of success. In life and work you are going to fart, fumble, and fall. You are human. It is not about avoiding falling down it is about how you pick yourself back up again. Everyone is screwed up: I am not okay, you are not okay and that is okay. Placebos are examples of caring made tangible. Employee wellbeing is not a soft skill just as accounting is not a hard skill. Wellbeing embraces fluid skills when the fixed parts of our life are in need of repair. Reality is overrated, living through positive illusion, not delusion, is powerful and practical. Wellbeing is more than a personal endeavor it is a social phenomenon. Only you are responsible for your own well being but others are accountable for your well being just as you are accountable for their well being. No one can upset you after 90 seconds. Compliance is the anemic byproduct of power. We do not resist change we resist coercion and the gravity of the familiar is what holds us in place. If life throws you a lemon — duck, determine where it came from, think about what you can do about it and only then contemplate making lemonade. Positive thinking must be changed into a more authentic constructive thinking. Lots of bad things do happen and positive thinking may be a disrespectful glossing offer the richness, albeit ruggedness, of human experience. Bad is at least twice as salient as good in most situations so we must tip the scales of good for good. Most of what we know really isn’t so. Contradiction is only troublesome if you are locked into rigid thinking and a fixed mindset. Take a long shot, Charlie Chaplin once said, “life is a tragedy in close up and a comedy in long shot.” How long does it take you to get a long shot on things? Tom Rath and Jim Harter, Well Being: The Five Essential Elements. Martin E. P. Seligman, Flourish: A visionary New Understanding of Happiness and Well-being. Polly Labarre, Developing Mindful Leaders, Harvard Business Review Blog, December 2011. Next post in this series: How to enliven energy for employee engagement. 7. Make meaning – why work? Meaning. For work to sustain and enrich people it must be meaningful. Those who have a why to work can bear almost any how and a sense of meaningful work instills a strong and rich intrinsic motivation. Progress, when it is meaningful, can be one of the best events of our day. Trump how with why. Viktor Frankl concluded that the meaning of life is found in every moment of living and that life never ceases to have meaning. To move this to the workplace, if you have a why to work you can bear almost any how. Not everyone is engaged in meaningful work, but maybe everyone can be. Part of making this happen is helping organizations, leaders, managers, and employees learn how to co-create meaningful workplaces. Part of making this happen is helping workers to perceive and experience the greater purpose in their work. In the workplace, meaning is co-created between the organization and individual. It is not something we give to another person — meaning must be built through authentic conversations about the why of work. Whom do I travel with? How do I build a positive work environment? What challenges and interest me? How do I respond to disposability and change? Sure, we care about money and it’s nice to get paid, but there’s also a whole range of other things that we get–a need for achievement and completion, competition with other people, and a sense of progress and a sense of meaning. And all of those things really, really matter. But as we move to a knowledge economy that depends more on people’s good intention and willing, and as the nature of work becomes more amorphic and work kind of interweaves with life in all kinds of interesting ways, as we move more and more to that kind of workplace, I think the relative importance of money is getting smaller and the relative importance of those other things could get… could get much larger…The first lesson is that we need to recognize how important meaning, completion, competition, motivations are in getting people to care and to work hard, and we need to try to encourage those…we need to do things that don’t undercut those human motivations. Get Pink with autonomy, mastery and purpose. Daniel Pink wrote the popular book, Drive: The Surprising Truth About What Motivates Us. Meaning and motivation according to the research Pink gathered is created through autonomy, mastery, and purpose. Pink stated that purpose maximization is taking its place alongside profit maximization as an aspiration and a guiding principle. We need to use profit to reach purpose, lessen the emphasis on self-interest, and help people pursue purpose on their own terms. Pink believe this may not only rejuvenate our businesses and organizations but also remake our world. Reputation (Who do other people think you are? What do other people think you’ve done lately?) . Reframe your values as promises. I appreciated Mike Morrison’s slim book on The Other Side of the Card: Where Your Authentic Leadership Begins. Mike was the Dean of the University of Toyota. He stated that one side of our business card has writing and the other has meaning. The meaning is created on the blank side of the card. The book offers a number of short exercises to fill the white space of our work with meaning. One element of the book that really stood out for me was to reframe values as promises. Values are often nice sounding statements that frozen in a framed wall statement while promises are something we keep. Ensure that your values don’t stagnate on the wall, think of them as promises, and then do all you can to keep the promises you make. you are in a better position than anyone to identify and articulate the higher purpose of what people do within your organization. Make that purpose real, support its achievement through consistent everyday actions, and you will create the meaning that motivates people toward greatness. Along the way, you may find greater meaining your own work as a leader. Double your WAMI at work. Michael F. Stager encourage us to fine our WAMI through a work and meaning inventory. People work for many reasons – some are obvious (I am paid to work), some are not as obvious (work is where my friends are). Research evidence and case studies testify to the reality that understanding how people approach work and what they get from it is vital to learning how to achieve the best possible outcomes for individuals and organizations. Meaningful work is a good predictor of desirable work attitudes like job satisfaction. In addition, meaningful work is a better predictor of absenteeism from work than job satisfaction. The Work and Meaning Inventory (WAMI) assesses three core components of meaningful work: the degree to which people find their work to have significance and purpose, the contribution work makes to finding broader meaning in life, and the desire and means for one’s work to make a positive contribution to the greater good. To download the 10-item WAMI assessment and scoring key click here. Create meaning rather than searching for it. Making meaning is a creative and co-creative process. Work with meaning while achieving meaningful results. Actively engage with some of the sources listed here to enhance your own meaning and help others create their meaning. Have wide eyes about your work so that you can see and experience the greater purpsse in what you do. Remind yourself that meaning is a process not an event. You don’t simply find meaning one day, you engage in meaningful work every day. Paul Fairlie, Meaningful work, employee engagement, and other key employee outcomes: Implication for Human Resource Development. Advances in Developing Human Resouces. December 2011. Viktor Frankl, Man’s Search for Meaning. Marshall Goldsmith, MOJO: How to get it, how to keep it, how to get it back if you lose it. Mike Morrison, The Other side of the Card: Where Your Authentic leadership Begins. Teresa Amabile and Steven Kramer, How leaders kill meaning at work. McKinsey Quarterly, January 2012. How to leverage 5 pathways for strengths based employee engagement. Next post in this series: Experience Well Being. 6. Leverage Strengths – An outline of why employee engagement needs to be strong stuff. Let’s get strong in 2012. Engagement is strong stuff. When you know your strengths, live your strengths, and leverage your strengths in the service of others you will have increased engagement, happiness, and well being. To bring out the strengths of others we must be aware of our own strengths. 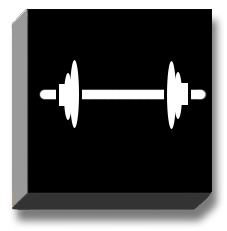 Powerful managers “spot” employees’ strengths and make strength training and strengthening routines a daily endeavor. Strength Based Leadership. I have been a student of strength based leadership for 7 years. If you go back and read blog posts on this site from 5 years ago you will see most of them had a strength based leadership focus. In fact, this specific blog was started November 11 2005, the day Peter Drucker died. I dedicated the website to his legacy and encouragement of a strength based approach to work. I have taken inventories of my strengths, taught strength based approaches, encouraged thousands of employees to learn more about their strengths and believe that strengths are a foundation cornerstone in the pyramid of employee engagement. Overtime I realized that strength based approaches for work were best subsumed under the broader perspective of employee engagement. Don’t be a sucker, heed the advice of Peter Drucker. Follow Martin Seligman’s strong path towards happiness and well being. Gallup along with your strengths, your winning combination is 40-22-1. Set aside your trombone and find your strengths by looking at what engages you (Marcus Buckingham). See your best reflections as others offer you your reflected best self. What should my contribution be? Accept yourself. Don’t try to change yourself, Drucker cautions. Instead, concentrate on improving the skills you have and accepting assignments that are tailored to your individual way of working. If you do that, you can transform yourself from an ordinary worker into an outstanding performer. Today’s successful careers are not planned out in advance. They develop when people are prepared for opportunities because they have asked themselves the above questions and rigorously assessed their unique characteristics. Follow Martin Seligman’s strong path towards happiness and well being. If Drucker is the dean of management then Seligman is the dean of psychology and leader of positive psychology. Seligman is a cautious academic, former head of the American Psychological Association, and a true difference maker. He was instrumental in turning psychology toward a balance of the positive and the negative. Starting with Learned Optimism and then moving to Authentic Happiness Seligman created a constructive and positive foundation for psychology. In regards to strengths the single greatest resource Seligman was involved in creating was the is the VIA Strength Survey of Character Strengths – measuring 24 character strengths. Of all the strength assessment inventories available I recommend this one the most. It has a universal perspective, it can be applied both inside and outside of work, and best of all it is free. Research has gone on to demonstrate that is you know your top 5 strengths, use them on a daily basis, and leverage them in the service of others you will have a much higher level of happiness and well being. My top 5 VIA strengths going back to November 2004 were: humor, creativity, curiosity, love of learning, and perspective. Gallup along with your strengths, your winning combination is 40-22-1. As an organization Gallup has been at the forefront of helping individuals and organizations bring strengths to work. The third question in their famous Q12 survey of employee engagement is: At work, I have the opportunity to do what I do best every day. Marcus Buckingham and now Tom Rath have created powerful and popular books and resources for strength based work. Their primary strength-based assessment is StrengthsFinder 2.0. You can take the online assessment after purchasing one of their books related to strengths at work and entering the code at the StrenghsFinder website. Gallup does an impressive job of creating helpful information and resources to learn more about your strength and how to put them to work. They offer a number or resources in addition to StrengthsFinder 2.0 to get the most from your strengths. 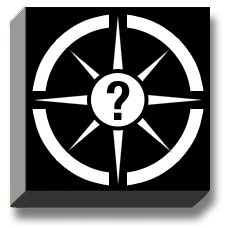 My top 5 StrengthsFinder 2.0 strengths are: maximizer, strategic, positivity, ideation, and empathy. Set aside your trombone and find your strengths by looking at what engages (Marcus Buckingham). Marcus Buckingham worked with Gallup and is now a very popular independent strength based speaker, writer, and coach. He has just developed yet another strength assessment tool for work in StandOut – designed to help you find your edge and win at work. His assessment is okay but I believe his best contribution was in the book Go Put Your Strengths to Work and the video, Trombone Player Wanted. I especially appreciated how, at that time, Buckingham encouraged us to find out strengths not in an assessments or inventories but by paying very close attention to what we looked forward to doing each day at work, what fully engaged us at work while we were there, and what gave us our greatest sense of satisfaction. In other words, we looked at what engaged us to determine our strengths and then we maximized these activities and roles to enhance our engagement. There was no need for an inventory or test. I think his delightful video series on Trombone Player Wanted was a great way to help a team build strengths by watching the videos together, having conversations about the applications and implications of what he said, and holding each other mutually accountable for bringing their best to work each day. See your best reflections as others offer your reflected best self. The University of Michigan’s Center for Positive Organizational Scholarship developed the Reflected Best Self Exercise to use stories collected from people in all contexts of our life to help us understand and articulate who we are and how we contribute when we are at our best. These stories collected from people who know us can strengthen and connect us to others, help us experience clarity about who we are at our best, and refine personal development goals so that we can be at our best more often. I think the strength of this approach is the social element and as opposed to the anonymous feedback of a 360 evaluation it offers triggers for further discussion and elaboration from the people who let us know what we were like when we were at our best. Many of us have blind spots or lacunas about our strengths and the reflected best self exercise can fill in the holes. Don’t merely reduce strengths to a list of 5 attributes. Be mindful of what truly engages you and work backwards from engagement to strengths. Notice other people’s strengths and give them lots of strength based feedback. Develop a daily structure or reminders so that you don’t lose your strengths in the flurry of demands and activities. Be disciplined about your strengths and turn your strength based work into the foundation of your work. Gain additional strength perspective and insight by taking another popular assessment for strengths at work: Strengthscope. Next post in this series: Make meaning. Here is a free e-book I created for the Trombone player video series which includes a review of StrengthsFinder 2.0. Click here to read or download.